I signed on Ebates Canada few weeks ago! 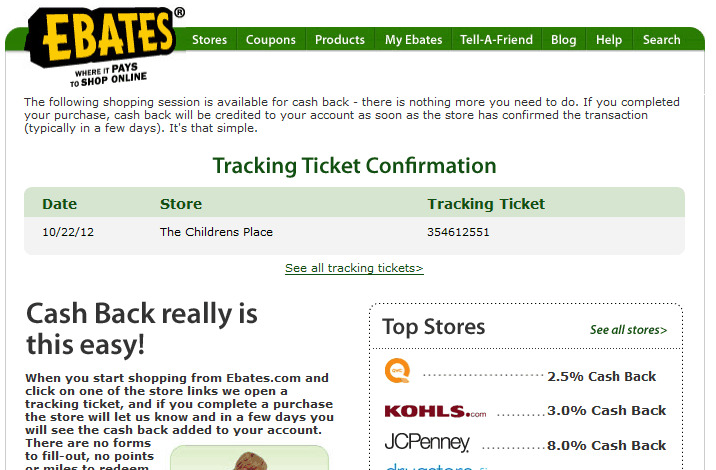 For those who are not familiar with this concept, Ebates is an online cash back shopping site. It features many brands and useful goods, such as: GAP, Children’s Place, kitchen items and more! For each purchase, you earn a cash back that is paid to you every quarter! Signing up is free and takes only 15 seconds! When signing up, you can choose your email subscriptions settings. I chose the Site Wide sales where I receive special sales, deals and promotions that are available only to Ebates Canada members! Each day, I browse those interesting deals. 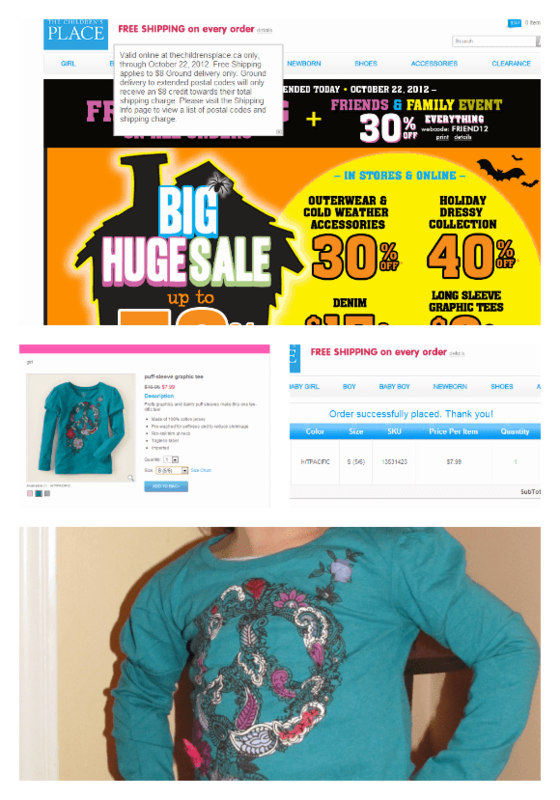 Last Monday, I stumbled on this great offer from Children’s Place: 30% off any order! Since it was my daughter’s birthday (she turned 5), I decided to surprise her with something from her favorite store. I buy most of my daughter’s clothes at this store: it has great designs and colors! When I clicked on Shop Now, the following message popped up. I was always wondering how Ebates Canada can track my order. For each order, they have a tracking number. Then I was sent on to the Children’s Place online store. I was happy because they had a free shipping on every order that specific day.I went to the girls section at Children’s Place and chose this graphic tee! It was on sale for $7.99 compared to $16.06 and shipping was free. I placed the order without any issues! I received my order within few days. My princess was happy with her gift! Then I went to check my Ebates Account! According to my account, the cash bask will be credited within few days! That’s pretty fast! Few days later, my account was credited with $0.40 representing my cash back! It was an easy and fun experience! I like the variety of deals Ebates Canada offers! I check them every day and will be sharing with you some of them! So why wait? Sign up today! Also, for each friend you refer, you earn $5 bonus! You can even win an iPad if you refer 50 friends! So start telling your friends and family about Ebates Canada, they’ll be happy you did! I tried ebates for the first time on saturday. I bought some clothes from Penningtons because they were having an amazing sale. I spent 64.00 and got 2.50 cash back. It doesnt seem like much but it will add up and if you are going to be doing any online shopping you might as well get money back. Cyber monday here i come! Don’t forget Black Friday! They are having double cash back! It will add up quickly! Thanks for sharing this. I would love a fun and easy way to shop! Have to check this out! Thanks Denise! It is easy and they have great deals, coupons too. I am just loving it! I don’t shop online often enough for this to work for me but for those who do, this is a great idea and those cents would add up fast. I had never heard of this before. Getting incentive for the spending we already do seems to be the way to go now-a-days. I love the idea of rewarding us for being customers! Great reveiw!